BELIZE CITY, Thurs. 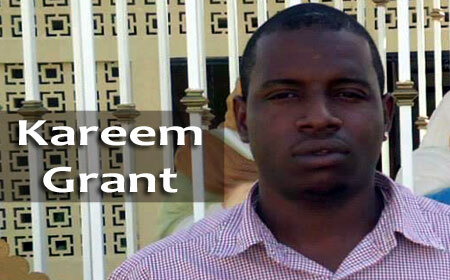 May 21, 2015–Kareem Grant, 26, of Periwinkle Street in Lake Independence, died after being shot at about 8:30 last night in the yard of an unused house on the street, two houses from where he lived, while socializing with his friends. His killer went to the gate and fired about 7 shots at Grant, hitting him in the head, chest, and back. The unknown killer then escaped from the area. Grant was rushed to the Karl Heusner Memorial Hospital, where doctors tried to help him, but nothing much could have been done, and he died shortly after at about 10:00 p.m. His body was taken to the morgue, where it is to undergo a post-mortem to certify the cause of his death. Police said that they recovered (5) 9mm expended shells from the scene and have since detained two persons pending investigations. His neighbors on Periwinkle Street told Amandala this afternoon that they were in their yard socializing when they saw a young man pass their yard, walking hurriedly and holding something under his shirt. Shortly after, they heard a single gunshot explosion. They all took cover on the ground, then, after about five seconds, they heard about seven more gunshots. They then heard screams, and there was confusion. When they were able to take a look to see what was happening, they saw Grant being taken to the Karl Heusner Memorial Hospital in his vehicle. Police went to the scene shortly after, but the shooter had already escaped. We were told that no one lives in the house which is in the yard where Grant was shot, and people in the area often go into the yard to socialize. Grant’s neighbor said that they usually hang out in front of the yard, but yesterday evening, for some reason, they assembled in their own yard instead and only a little boy was out by the fence sitting. When the first gunshot erupted the little boy ran into their yard, and took cover with them. They said that they did not come out immediately, fearing that the gunman was still lurking around to shoot them.